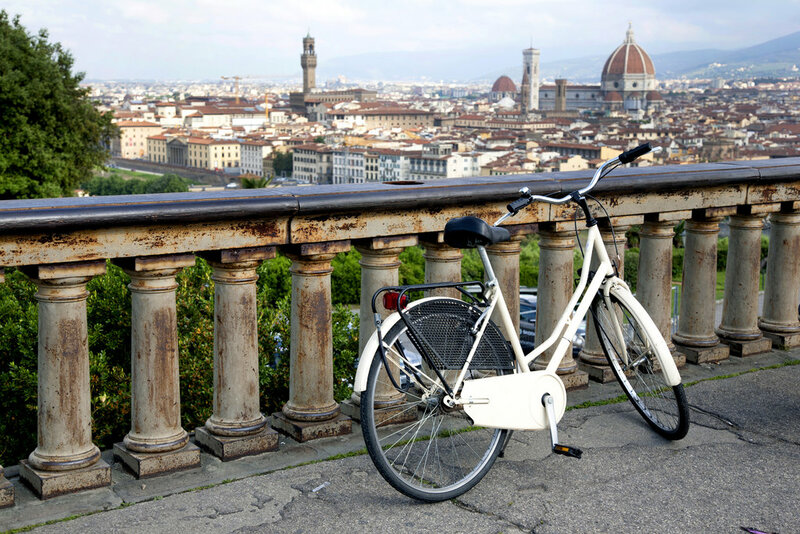 Florence is a perfect destination for bicycling: mostly flat, crisscrossed by small avenues where buses can’t go, and filled with gorgeous landmarks and neighborhoods that are wonderful to explore alfresco. This half-day tour—great for families, or those who have just arrived in Florence—provides an ideal way to learn your way around the city and touch on its most important highlights (though it doesn’t include entry to museums and historical sites, you’ll know where to go on your own later). You’ll be accompanied by an expert, English-speaking guide, whose knowledge of the city will enrich every aspect of your exploration. After meeting with your group, you’ll be led to our bicycle depot, where you’ll be matched with a bike and gear, and start off on your approximately three-hour, leisurely ride around the city. Your route will vary, but will take in many of the major Florentine points of interest—including The Duomo, the Palazzo Vecchio and Uffizi Gallery, the basilicas of Santa Maria Novella and Santa Croce, Ponte Vecchio, Palazzo Pitti and the Boboli Gardens. You’ll also, however, explore some more off-the-beaten-path spots, like the Piazzale Michelangelo in the Oltrarno district, that offer spectacular views over the city. You’ll have many chances for photo opportunities and to sample gelato or coffee from a typical Florentine café. Families with children are welcome to join the tour! Child seats, trailers, and helmets are available on request. Children must be at least 9 years old to ride independently; those younger than 9 may ride on a tandem bike, or in a child seat, with a parent. Please note that only the outside of monuments and museums will be visited on this tour. Sunscreen, comfortable clothing and shoes. You will be biking for approximately 3 hours during the tour, on roads that are mostly unshaded.